A PC suite is must have software for phone or tablet users. It lets you transfer and manage large files on a phone from the PC. PC suite for Android can couple a mobile device to a computer or laptop through WiFi, Bluetooth or a USB connection. It allows you to manage & backup your phone or tablet’s data efficiently. The software allows users to use their phone as a dial-up modem to set up internet connection. They can function as APK installers. You can use them to install APKs which you’ve downloaded on your PC on your mobile. They can transfer video and audio files between 2 devices. You can use an Android PC Suite software to flash custom ROM and update the OS on your mobile device. If ROM flashing or update fails, you can restore the backup easily with a PC suite application. Not many phone manufacturers have introduced an Android PC Suite software, but there are some third-party companies that have launched powerful desktop applications that allow us to manage data on our phones with ease. Here is the list of four most powerful and reliable PC suite for your Android device. Web PS gives you full control of your mobile or tablet through your PC. File transfer with this PC Suite software between 2 devices takes place over a secure HTTPS connection. This software supports batch download and uploads operations. It comes with a text file reader. It allows you to manage contacts, SMS and APK files on your device. Instead of passwords, QR codes set up the connection between mobile and PC. The above applications support Android devices from all mobile manufacturers. The Syncios PC Suite has an inbuilt utility that can convert video & audio files to other formats. You can also create ringtones with it. Syncios can backup and restore iPhone and Android data. It allows you to manage media files on the computer. Syncios lets you sync your iTunes playlist to Android devices. It allows you to download files from websites. It is compatible with all versions of IOS and Android devices. No matter what Android device you connect with the OC, MOBILedit will support it. This software enables you to manage content on your phone over a USB or WiFi connection. With this app, you can manage phonebook and SMS/MMS. You can even move contacts from one device to the other. MOBILedit can function as a ringtone maker & editor. It can transfer pictures from computer to mobile and vice verse. With this app, you can check battery percentage and network signal at your place. MOBILedit allows you to move data from an old phone to a new device. This software can identify and fix issues in your contacts. MOBILedit has an excellent interface. MoboPlay is a lightweight PC suite software which you can use to manage iPhone or Android data. During installation, the software asks you to select the OS which you want to use the PC suite with. MoboPlay supports IOS and Android OS. Choose your preferred OS and then select the start option. 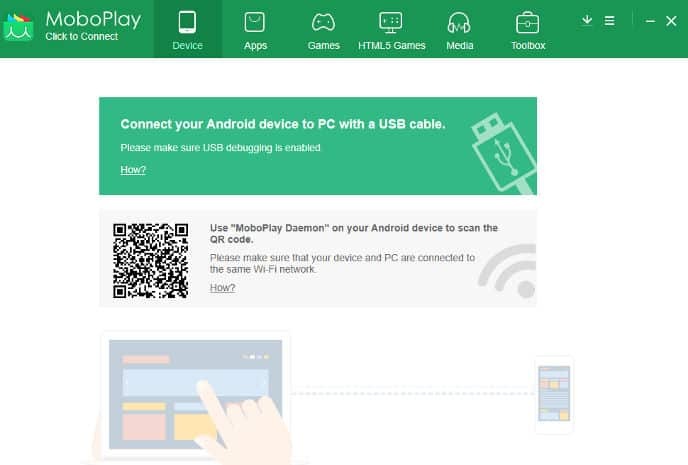 Once MoboPlay gets installed on your Windows PC, enable the USB debugging mode on your smartphone connect it to the PC. Now, run the PC suite. MoboPlay lets you install and manage Android or IOS apps and games. This app can function as a bulk IAP uninstaller and installer. MoboPlay allows users to Backup and Restore data on their smartphone. It has the option to free up the storage memory. MoboPlay comes with an inbuilt ringtone maker utility. The PC Suite software enables you to manage media files on the MicroSD or the internal storage memory of your mobile phone. It lets you see and manage the queued tasks. MoboPlay supports 9 international languages. Conclusion: As you can see above, Android PC Suite software comes in handy for various task. They make things easy for non-technical users. If you’re searching for an application which allows you to transfer all types of files, ignore the above software and install Lenovo ShareIT. LS uses WiFi technology to move a bulk of large files to a supported device within few seconds. Also see: How to download the latest Xiaomi PC Suite (Mi phone manager) in English? Next articleHow to access kik messenger on PC?